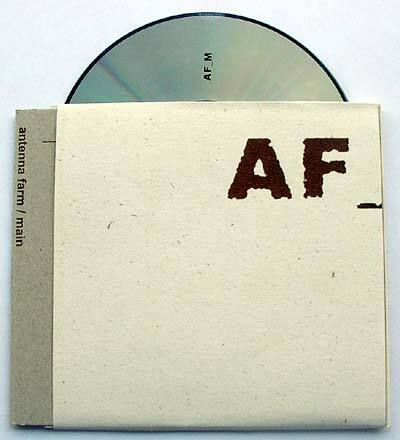 AF_M is the result of a collaboration between Main (Robert Hampson, formerly of Loop and Godflesh) and Antenna Farm (David Howell and Alastair Leslie). As the very first artists in Staalplaat’s new Brombron series, both artists were kindly invited to spend a week living and working at the Extrapool studio in Nijmegen, to collaborate together, and then release the results on a CD. These recordings were made utilising a variety of tools – powerbooks, contact microphones, guitars, mixing desk, fx, and and field recordings gathered from around Nijmegen. The three of them spent long hours in the studio working alone processing our own sounds, and then coming together at the end of each day to improvise collectively with these sounds. Becoming increasingly focussed, these improvised sessions were recorded directly down onto DAT. At the end of the week (July 7th – 13th, 2000), they returned to London with around 3 and a half hours worth of DATs. After a short break, they came together again at Robert’s studio in Croydon and began to isolate sections and edit together this material (again on powerbook). This editing was simple and truthful to the original recordings – no new sections were added, there was no reprocessing done. They simply isolated what was felt were the strongest recorded sections and then bolted these together. There were some crossfades created, but everything was kept in chronological order. The resulting audio coheres into a focussed document that slips from extreme quiet to scratchy, crackly ambience, drone passages, and occasional bursts of a more violent nature. Not something that works as a background music, the 5 tracks have been carefully placed together and require closer listening…..